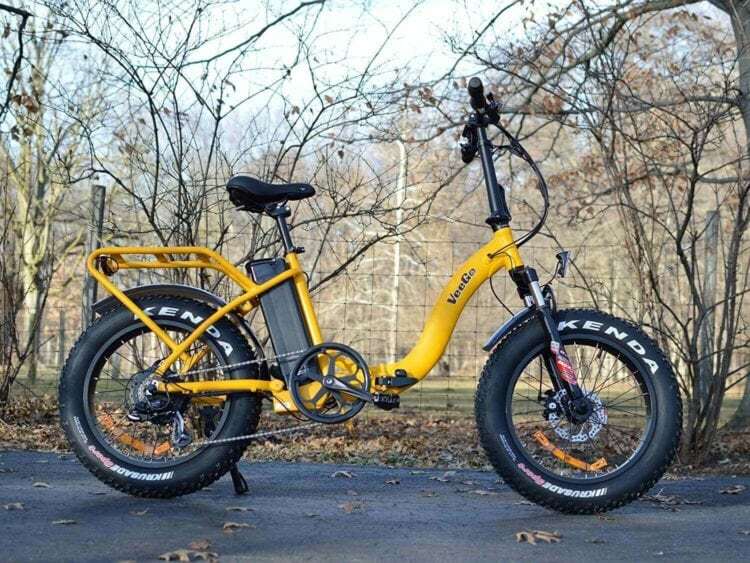 Folding Electric Bike – the ultimate bicycle! 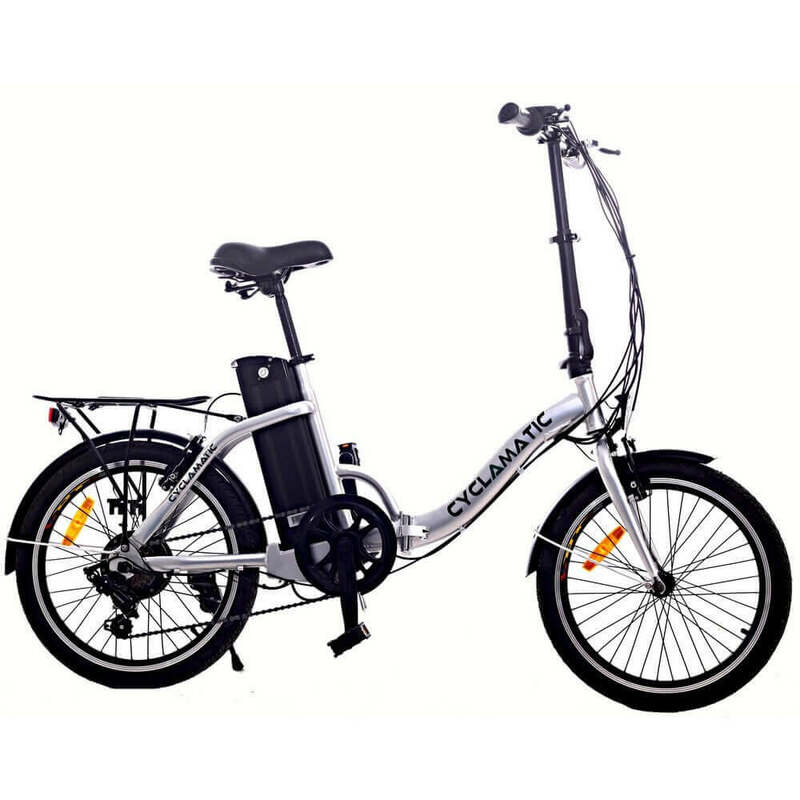 If you plan to buy a folding electric bike and are looking for some recommendations, then you have come to the right place. Hi, I’m Mark. Welcome to the Sporting Outdoors website! I own a couple of folding electric bikes and I think they are the ultimate bicycle. Maximum Speed – legal requirements in most countries require that electric bikes are speed-limited to 20 mph. Some bikes may be capable of exceeding this speed in “pedal-assist” mode where you’re pedalling and using the power of the motor simultaneously. Ultimately the maximum speed you require is based on your personal needs but do bear in mind that bikes which are capable of doing 20 mph are more likely to have higher power capabilities when, for example, it comes to assisting you to climb steep hills. Range – nothing could be more frustrating than running out of power before you reach your destination, particularly if it is on a folding electric bike which does not have the option to pedal! The distance that the folding electric bikes reviewed here can travel varies massively from 10 miles to an impressive 55 miles! I recommend looking at these criteria carefully when choosing the right bike for your needs and expected journey times. Battery Charging Time – it is preferable to have a bike which can recharge in the shortest possible time. The charging times of the folding electric bikes tested here ranges from 2.5 hours to 6 hours which could make a big difference to your daily schedule if you plan to use your bike to commute to work. Motor Rating – I would recommend ideally choosing a model with a motor power of at least 350 watts, although for lighter riders and flatter terrains you could get away with lower power ratings. This is definitely one criteria where spending additional budget is necessary to get the superior 500 watt motors which are far superior and, in my opinion, absolutely worth spending extra on. When it comes to riding quality, the VeeGo is up there with the best on the market. It’s 500W hub motor and heavy duty cargo rack makes it a fine bike for patrolling around on. 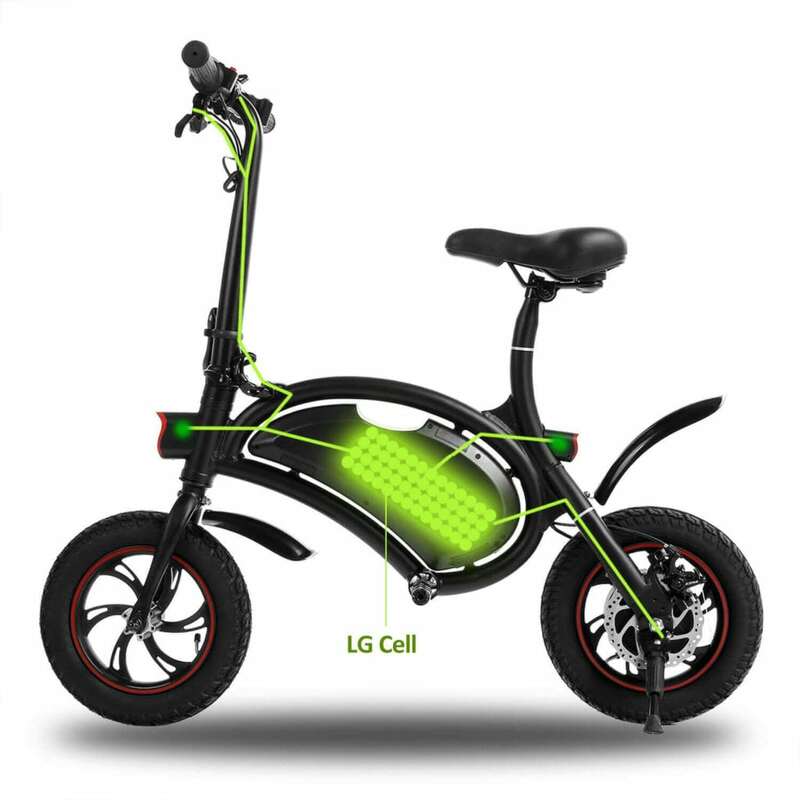 The awesome 48V Lithium-Ion battery makes sure you always feel safe riding around on this, with up to 50 miles using 5 different levels of pedal assistance along the way. The strong frame offers durability and resistance, but is easily folded away in under ten seconds. With all manner of extras like heavy duty cargo racks, this is a fine bike for those using it for semi-long distance travel. The battery, stored just beneath the seat, ensures a low centre of gravity making it very easy to balance on the Veego, even at low speeds. I really like the the 20×4” Kenda Krusade sports fat tires which offer ample riding durability, and look uber cool too. This easily charges up in no time, too, taking around four-hours for a full charge on average. The 7-speed Shimano Drivetrain gear option, combined with Tektro Disc Brakes, ensures that this bike can stop without any issues. At 63 pounds, too, this bike offers you a sturdy, strong yet easy to manoeuvre model that you can have little to no problems with. The rider weight limit of 275 pounds is impressive, too. Add in the fact that the frame is solid and sturdy, and this is a good all-terrain option. The integrated headlight and taillight also makes sure that you never need to worry about visibility. The 7-speed Shimano Drivetrain gear set offers you the perfect combination of comfort, control and consistency, as well. With up to 100lbs of capacity on that cargo rack, too, this is the perfect folding electric bike for the travelling type! 500W brushless motor offers epic power. 5-level pedal assistance is outstanding. Very comfortable, easy bike to ride. LED computer is hard to read on a sunny day. The ProdecoTech Phantom X2 makes a fine choice of bike for anyone looking to add that extra touch of craft and convenience to any ride that they take on. 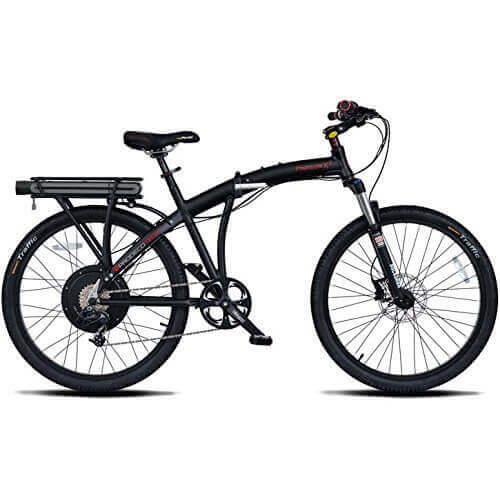 With its 26 inch wheels, Avid hydraulic disc brakes and Sram 8-speed shifter it offers all the benefits and convenience of a regular mountain bike with the added luxury of having a powerful 36V, 500 watt motor which is capable of covering up to 30 miles at 20 mph. The Prodeco consistently gets rave reviews from all who have used it, and it’s easy to see why. This is a bike that is made for endurance riding while making it easy for your bike to keep well-powered for even the most challenging of rides. 2-year warranty provided for added comfort and peace of mind. Top quality body shape adds comfort even for taller body types. Charging could be faster, making it necessary to pre-charge before heading out. Wheels are strong but need to be cared for more than other models might require. Battery pack is above the rear wheel which can be off-putting for some bike riders. 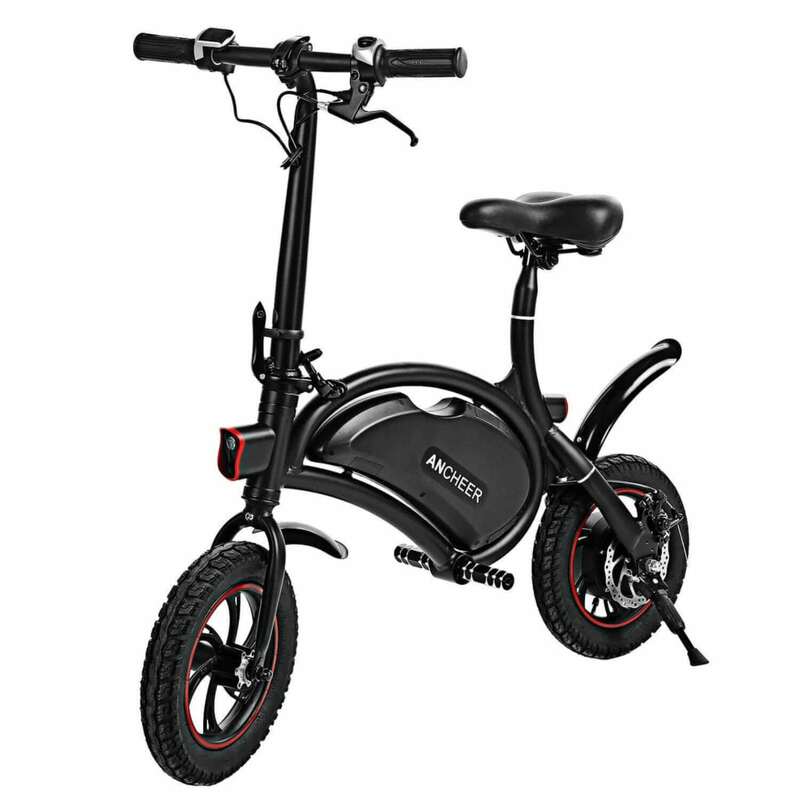 The Ancheer Folding Electric bike scooter makes an excellent choice of bike to go for and at under $400 offers fantastic value for money. It’s a high quality bike scooter, albeit let down by the fact it can only do 12-miles of range before needing charged. The 350W high-speed motor allows for speeds of 12 mph, though, making sure you can fly around without too much issue. The 4.4Ah battery also makes sure that you get plenty of bang for your buck. With a route of distance of around 12 miles, you can get quite far with this bike before it needs to be charged again. Weighing just 26.5lbs, too, it’s very easy to transport and can be carried in just one hand by the average person. Charging times of just 3-hours makes this a very easy bike to get ready to use. Top quality foldable system that can be locked using a password system. Powerful, comfortable and very easy to cycle around on. Password protection system must be reset or 123456 is the basic password. Mileage and time recording can be hard to read on a sunny day. Frame is strong, but wheels are easier to puncture than they should be. 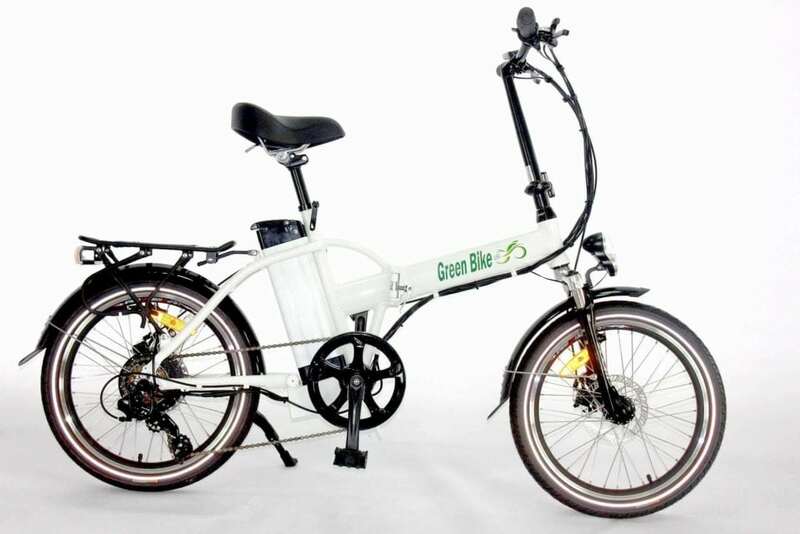 Highly impressive and easy to ride around on, the Greenbike GB5 is a very impressive piece of kit. A high quality bike design with ample features to pick from, cycling around on this bike is very easy. With a whopping speed of 28mph and with a 6-gear Shimano solution, you can feel comfortable riding around on this piece of kit. It’s got 3 modes to choose from, making it easy to ride at exactly the level you feel comfortable on. The 36V/13Ah Lithium battery offers up to 50 miles of distance for a single charge. The puncture-resistant wheels make sure that you can cycle around in total safety and security, too, vastly improving your sense of comfort when you ride around. Fully suspended bike for easy riding up to 20mph. The Tektro disc brakes were not as powerful as some other models tested in this review. The bike is somewhat rear heavy and be prone to doing a wheelie if you quickly accelerate. This comfortable and creative Wireless smart e-bike makes a fine starting point for any cyclist looking for a good value deal. With a whopping 350W high-speed motor and a 36V Lithium-Ion battery, this lives up to expectation and then some. The 3-hour charging time and 20-25km/hour riding times makes this very easy to cycle around on without issue. 12” wheels make sure you never feel like you are riding on anything too chunky, either. At just 26.5lbs you can easily swing this around under the arm and carry it in any way that you wish. It’s also powered by an app that allows you to set speeds, mileage and time recording to always be in total control on the road. Charges quickly for great performance. Not great for taller riders. 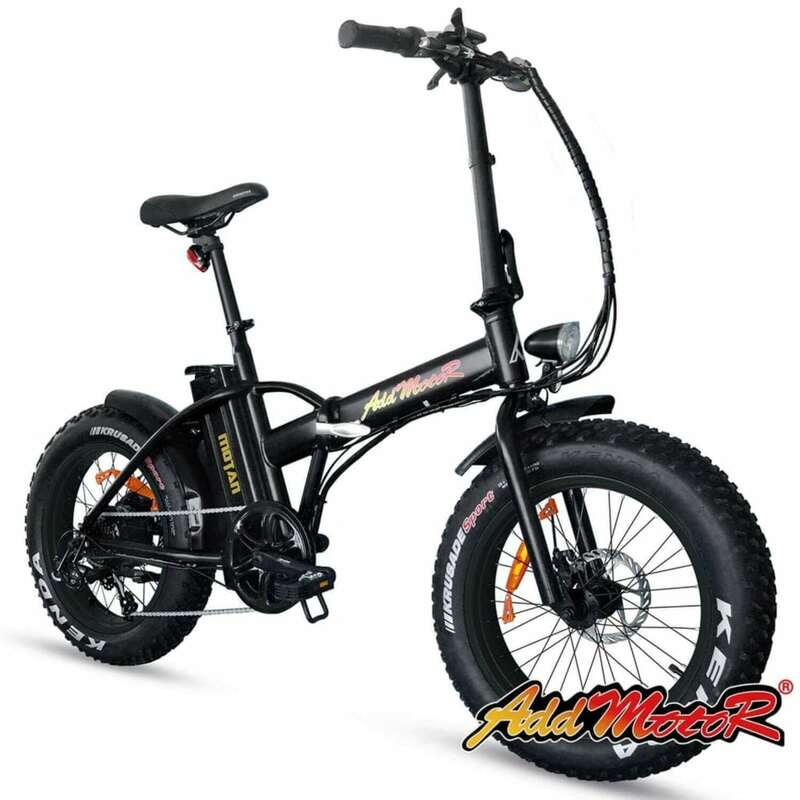 High quality and wildly impressive, Addmotor Motan Electric is one of the most impressive models of its kind out there at the moment. With a smart design that can fit people up to 6’6” in size, this bike makes it nice and easy for you to feel comfortable when out and about on the bike. With the weight quantity being as high as 300lbs, too, you can easily sit on this bike and feel extra comfortable as you ride around. Up to 23mph and 40-55 miles per charge ensures you are left with a bike that can deliver on your athletic needs and wants. You can still pedal this without a charge, too. The 7-speed TX55 gears will make sure you always feel safe powering around on this bad-boy, with the 500W motor making sure you can have ample pushing power as you go up and down whatever terrain you choose. High quality 6061 aluminium frame. Easy to set up and put away again. 20” Kenda tyres offer plenty of protection for the bike. 60 TPI fat tires ensure your bike always feels safe. Charge time can take up to 4 hours. When it comes to comfortable quality, the Cyclamatic CX2 is a very good folding bike to work with. With a distance of up to 31 miles and a speed up to 15mph, this gives you a very impressive cycling solution. With up to 6 hours to charge, though, you might want to make sure you pre-emptively charge it up before trying to take off. The 250W motor and 8.8Ah battery gives you ample performance time, too, making sure you can get around with a minimum of fuss. The 20” Kenda tyres make sure you are left with an easy to use system, while the 6-speed Shimano gears makes sure you can be easily all-set for a safe, simple and durable ride time and time again. Front and rear mud guards are impressive. Very heavy for a bike of this kind (57lbs). 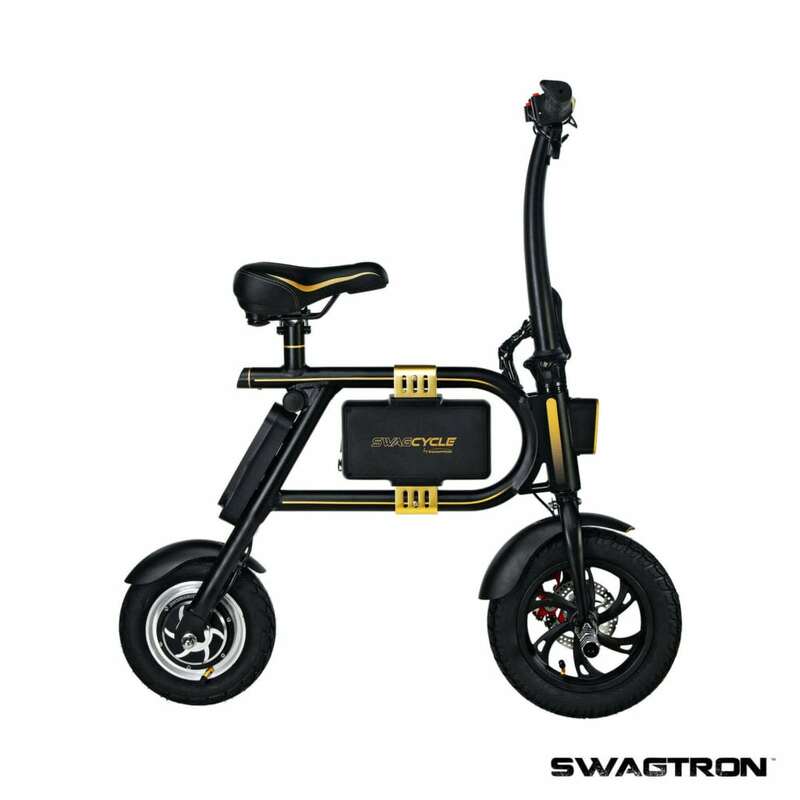 Comfortable and very easy to use, the SWAGTRON might look a little odd – but it’s up there with the most popular bikes of this kind with good reason. The 36V battery and 250W motor makes sure you can breeze along for up to 10 miles, at 10mph. While not the fastest, it’s very easy to get to grips with and makes a fine folding electric bike for a starter. Charging in just 2.5 hours, too, you can even charge your devices on-the-go using the micro USB charging dock. It’s also 100% emission free, so if you are looking for a green-friendly bike you can turn to this and get the greatest level of riding satisfaction you can. Just 35 pounds in weight. Lithium metal battery lasts for years. Could be faster and more durable battery-wise. Only supports up to 264lbs in weight. 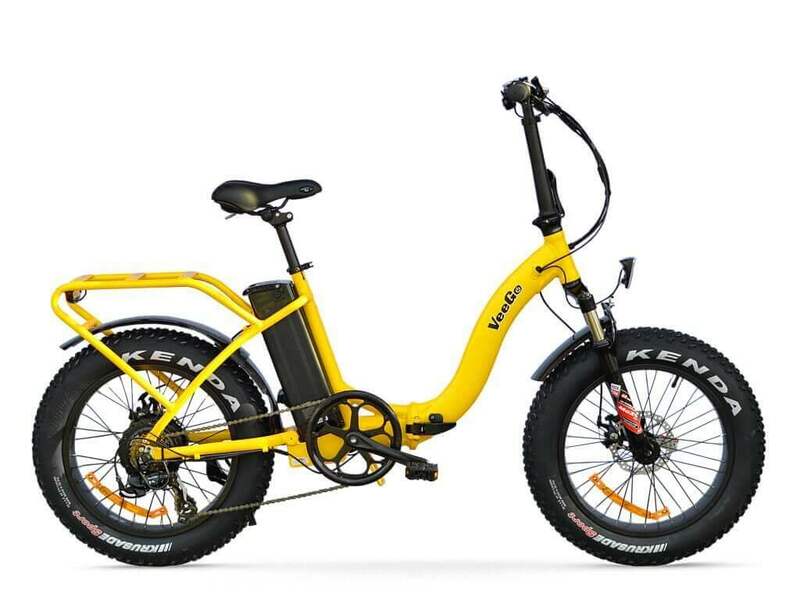 The e-Joe Epik SE Sport Edition folding electric bike is one of the most reliable on the market at this moment in time. With an impressive maximum speed of 20mph, this provides you with a fully street-legal biking solution without the need for registration or insurance being needed. The 18,650-cell battery, located inside the frame for safe keeping and easy control, provides you with 36V, 13Ah high-capacity system that is easily charged up. Charging time takes around 4-hours to charge up. The bike also uses an impressive 350W Peak Rear brushless geared hub motor. With a motor that can more than easily pull this along at 42 pounds of weight, this is more than capable of delivering on what you would expect. The 7-speed Shimano Tourney TX-55 transmission ensures it can easily handle itself on just about terrain type, too. A high quality frame that’s strong, sturdy and reliable. Great speed and battery power. Comfortable to ride, easy to assemble. 3-level pedal assistance with thumb throttle control. Pedal assist can be off-putting for beginners. Last but not least, always remember that no folding electric bike is perfect! So the aim is to get the best folding electric within your budget range. I have changed folding electric bikes several times in the past few years and while each time has been an upgrade, I still love every one of the bikes I owned. This is because I did a lot of online research before buying and each model I bought was the best within its range! 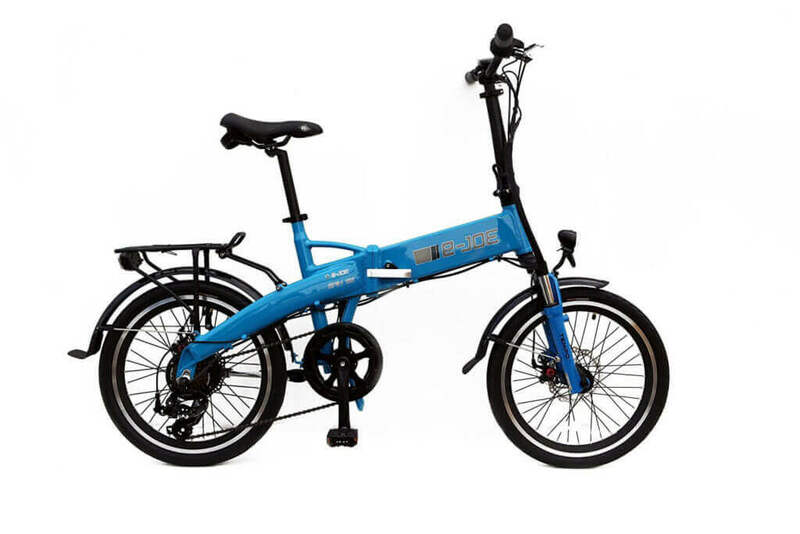 Thank you for visiting my website today, I really do hope you found this article useful and wish you happy shopping for a new folding electric bike. I hope you have found this article useful and would love to hear from you on which folding electric bike is your favourite. If you would like to purchase one of the bikes reviewed here, you can do so by clicking any of the links above. Placing your order through these links won’t cost you anything and helps me to cover the server costs without the need for annoying pop-up links.